Everyone’s favourite pirate radio crew comes to Bristol for a Motion takeover. 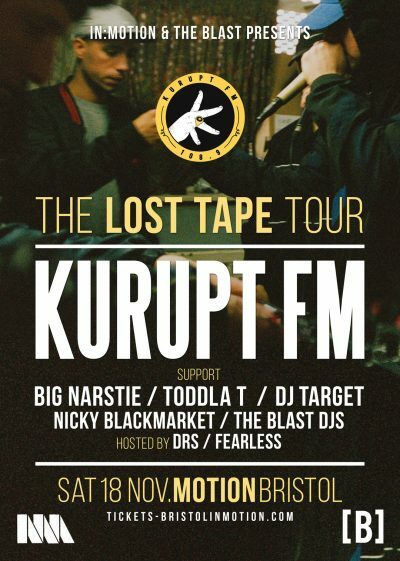 Anyone who has seen the People Just Do Nothing stars doing their live thing will know Kurupt FM goes way beyond comedy. You only need to take a look at the list of acts who’ve appeared on stage with them to know the respect is real, having called on the likes of Stormzy, Newham Generals and DJ Luck & MC Neat in the past. The group from the series all have previous playing on pirate radio and the show is created with such affection for the scene it should be no surprise Steves, Beats and Grindah know how to rock a party. With a ‘Lost Tape’ in the pipeline for real on XL, the crew bring their classic selection of 2-step and garage and recreate ‘the best set they ever played’. Support comes from Big Narstie, who with his infectious vibe always brings the heat whenever he plays in Bristol. In Toddla T, we have another legend of UK music and radio culture, drawing on UK bass music in all its forms, while 1Xtra’s DJ Target is also on hand: a man who, as Roll Deep’s DJ and Rinse FM OG, has earned his status as one of the most reliable selectors on the circuit. With Nicky Blackmarket, the man behind Blackmarket records and its legendary jungle section, we’ve got drum & bass covered, and the Blast DJs represent the scene locally. Expect nothing less than shellings all over from this one.